2) Billy Kaplan is rockin the most wicked side-swept bangs this side of alterna-comics. 3) The title placard has a conversation with itself. 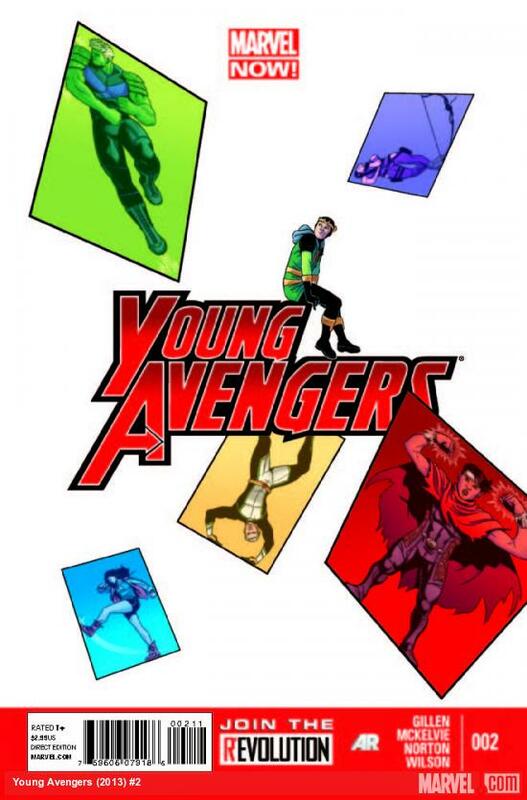 I could get into a bunch of other reasons why Kieron Gillen and Jamie McKelvie’s Young Avengers is the freshest comic coming out of the House of Ideas right now, but then I’d be spoiling all the fun. I will say that Gillen’s post-modernist, über-meta storytelling and Jamie McKelvie’s hyper-realism mesh together like chips and guacamole on a Sunday morning. The things that happen in this book are unlike anything that will happen in any other mainstream superhero comic this week, no matter how Body-Snatchery or Minimalistically Surreal those other books might aspire to be. I didn’t like the first one at all for some reason it might be because I really don’t like Gillen at all. Iron Man’s Marvel Now was one of the worst comics I have read, plus the art wasn’t good. He has a certain style of writing and it just doesn’t appeal to me. I’m glad your enjoying this book but it just doesn’t do much for me. Fair ’nuff! Everyone’s entitled to their personal predilections!! If you are interested in giving Gillen and/or McKelvie another shot, check out Phonogram!!! Really excellent series that mixes supernatural elements with the indie-punk scene!